Dubai officials said all the bridge works related to the Route 2020 network will be completed by the end of next month. Director-General and Chairman of the Board of Executive Directors of the Roads and Transport Authority Mattar Al Tayer said the construction work on the viaduct of the metro route was progressing at a steady pace. He was briefing Vice President and Prime Minister of the UAE and Ruler of Dubai His Highness Sheikh Mohammed bin Rashid Al Maktoum who visit the site to review the Route 2020 stations progress. 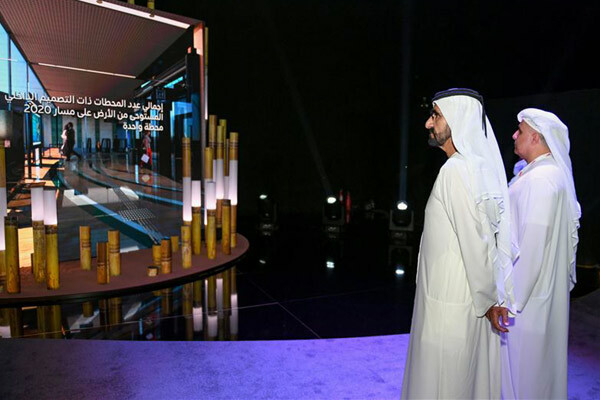 Sheikh Mohammed said that infrastructure projects in Dubai and the UAE were a key part of the country’s comprehensive development plans and played a vital role in enhancing the economic environment. He said that Dubai Government had allocated 21 per cent of its budget for new projects as well as projects to enhance the efficiency of existing infrastructure as the city was preparing to host the Expo for the first time in the region. Dubai Government had already set aside Dh5 billion from its 2018 budget to projects related to Expo 2020, he added. Sheikh Mohammed further said that the happiness and welfare of the community were high-priority strategic objectives for the government. A quality infrastructure helps attract tourists and investors and enhances the country’s position as a favoured destination for living and working, he noted. Sheikh Mohammed also praised the infrastructure development efforts of Dubai Roads and Transport Authority (RTA), which complement Dubai’s economic and social development projects, and support the objectives of the UAE Vision 2021 and Dubai Plan 2021. His later reviewed the designs of the metro stations featuring four different themes. He was accompanied by Crown Prince of Dubai and Chairman of The Executive Council Sheikh Hamdan bin Mohammed bin Rashid Al Maktoum and Deputy Ruler of Dubai Sheikh Maktoum bin Mohammed bin Rashid Al Maktoum; President of Dubai Civil Aviation Authority, Chairman of the Emirates Group and Chairman of Expo 2020 Higher Committee Sheikh Ahmed bin Saeed Al Maktoum; Chairman of the Mohammed bin Rashid Al Maktoum Knowledge Foundation Sheikh Ahmed bin Mohammed bin Rashid Al Maktoum and Sheikh Mansour bin Mohammed bin Rashid Al Maktoum. The design of the iconic station at the Expo site features plane wings that reflect the city’s journey towards the future through innovation. One of the key stations of the project that will serve millions of visitors, it has been designed to ensure the smooth entry and exit of passengers at all times. The project also features an interchange station linking Route 2020 and the Red Line of Dubai Metro at Nakheel Harbour and Tower Station. Its design is similar to the existing stations. The designs of the elevated and underground stations were tailored to provide higher capacity than the existing stations on the Red Line. The elevated stations have an area ranging from 8,100 to 8,800 sq m and the areas of the underground stations range from 27,000 to 28,700 sq m. The Expo station has an area of 18,800 sq m. The interior design of the metro stations reflect the four elements of nature: air, earth, fire and water and features futuristic elements. The first of the new metro trains to be used on this route will arrive in Dubai in November. The first train will start operations in December. The RTA will start testing carriages in May 2019, and conduct test runs of trains in Feb 2020 to ensure the readiness of the train and control systems. The test runs will continue until the official opening of the project. Sheikh Mohammed later watched a video on the unique Expo Station, which has a capacity of 522,000 passengers per day in both directions, i.e. 29,000 riders per hour per direction. The station has two platforms and three routes linked to Expo 2020 and COEX as well as the Trade Centre and the urban complex. It will be integrated with public transport and parking will be provided for buses and taxis. His Highness also endorsed the futuristic interior design of the Expo station.